The Talbiyah (Arabic: تلبية) is a devotional prayer uttered by pilgrims during Hajj or Umrah after making the intention to enter into the state of Ihram. 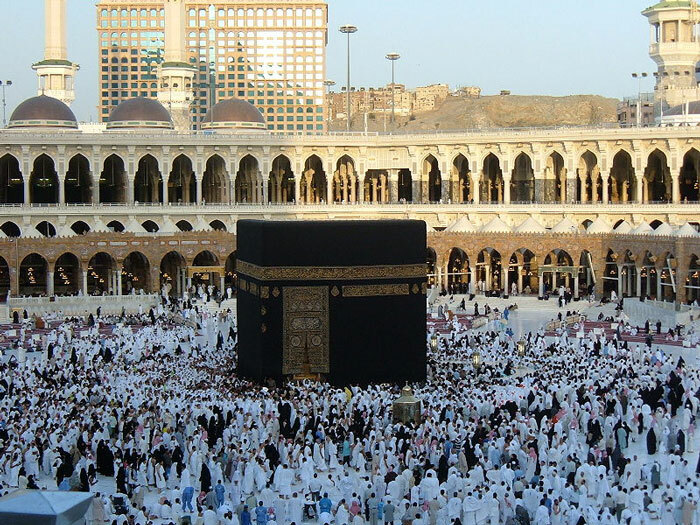 It is recited frequently throughout the pilgrimage. Men should raise their voices when reciting the Talbiyah while women should recite it softly. After reciting the Talbiyah for the first time, it is recommended to send Salawat upon the Prophet ﷺ and to make Dua for yourself and others. Talbiyah should be recited as much as possible throughout Hajj and Umrah. It is recommended to read it in all conditions including while standing, sitting, walking, travelling in a vehicle, laying down, in a state of minor or major impurity or during menstruation. It should also be recited when changing conditions, such as times or places like the coming of night or day, at dawn, when boarding or disembarking a vehicle, when encountering a group of pilgrims, after Salah and in any mosque. It is recommended to repeat the Talbiyah three or more times. It should not be read during Tawaf or Sa’i. Hajj pilgrims should continue to recite the Talbiyah until the stoning of Jamarah al-Aqaba takes place on the 10th of Dhul Hijjah, or just before performing Tawaf al-Ziyarah if that is performed first. Umrah pilgrims should stop reciting it just before the commencement of the Tawaf of Umrah. The recitation of the Talbiyah is considered to be Wajib by Hanafis and Malikis so neglecting it would render the Hajj or Umrah invalid according to these schools. From the Shafi’i and Hanbali perspectives, it is a Sunnah to recite the Talbiyah so if a person leaves it out, the pilgrimage would still remain valid. Sahl bin Sa’d narrated that the Messenger of Allah ﷺ said: “There is no Muslim who says the Talbiyah except that – on his right and left, until the end of the land, from here to there – the rocks, or trees, or mud say the Talbiyah. A Mutawwif (Arabic: مطوف), also known as a Muallim (Arabic: معلم) is a guide appointed by the Ministry of Hajj responsible for the needs and well-being of Hajj pilgrims.